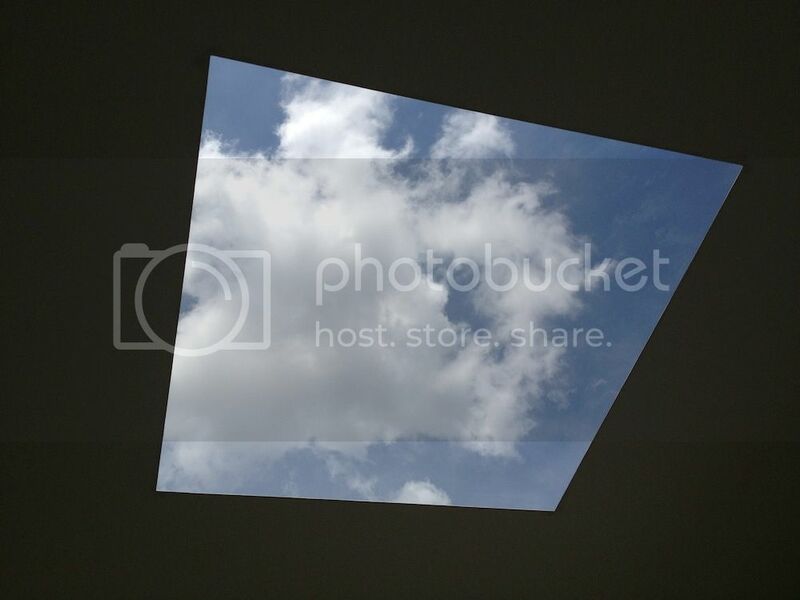 James Turrell's Rice University Skyspace is finally complete. The official opening was Thursday night. I wasn't there (my invitation must have gotten lost in the mail), but you can read about it at CultureMap. 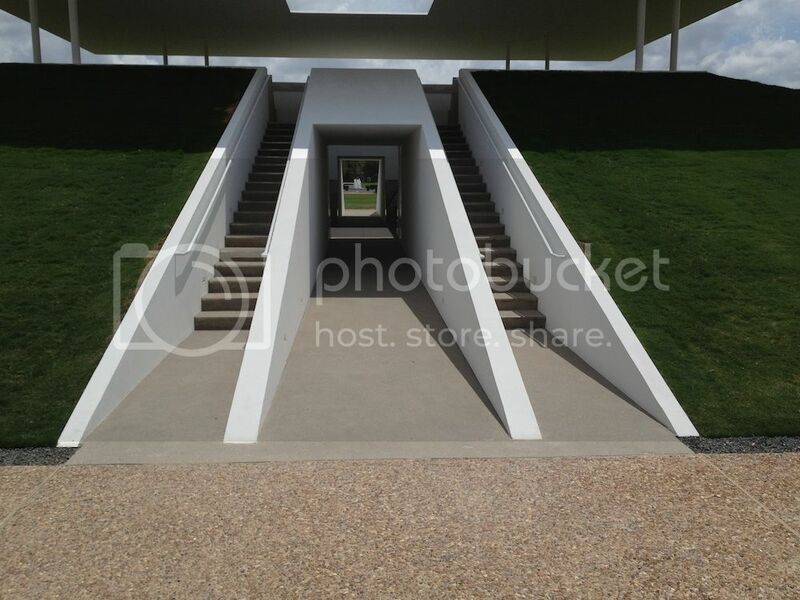 Many fabulous people were there--but the article doesn't mention Turrell being present. I'm sorry I missed the light show, but Swamplot has a bunch of photos (although I'm told that photos are a poor substitute for being there). But I went to look at it yesterday afternoon. I wonder what Ricardo Bofill thinks about having this earthen ziggurat plopped down in front of his broad colonnade for the Shepherd School. Personally, I think it's an improvement. Art-lovers rejoice, but groundskeepers are probably thinking, "Great--now we have to mow the side of a hill every week." The stairs going up lead to a balcony that looks down on the central pit. This would make an excellent dog-fighting arena. 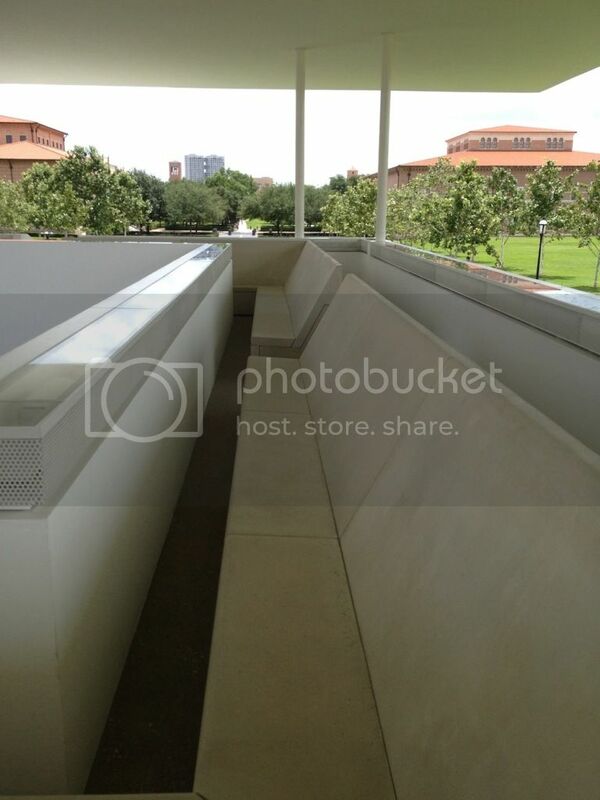 Turrell apparently took his cues from the designers of airline seating when he designed these benches for the balcony. This is supposed to look pretty trippy at twilight when the colored lights are operating. 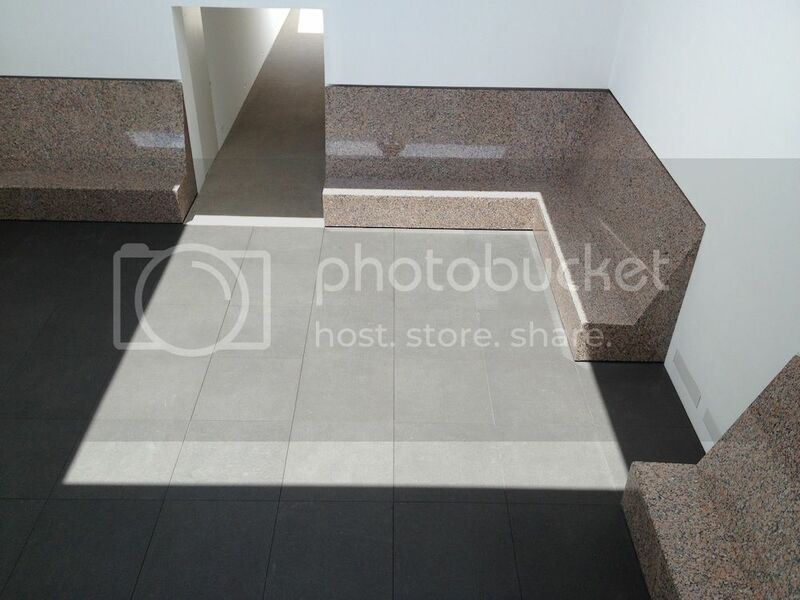 Looking down on this from above, my first thought was that it looked like a combat pit. But sitting in the pit was nice and cool. There is something about the way this is built that makes the temperature inside the pit significantly cooler than the outside. It's a relaxing environment. Skyspace is within easy walking distance of McNair Hall, the business school building. I wish Skyspace had been here when I got my MBA (class of 2008). This would have been a pleasing place to study or just unwind. So as much as I make fun of it above, I suspect it will become a hangout for students, which is really the best thing one could hope for.